To your feedback has been published, it is necessary to talk about their experiences of using the goods to which the review. Describe how you liked the product, or, conversely, what are the problems you are facing. reviews such as reviews, located previously. Questions also are not published. You can ask questions to our experts via the contacts specified in the header. Fits for following models:* RMC-M90E. CERALON® is a top quality antiadherent material produced by well-known Swiss company ILAG®. Its unique technology of applying ceramic to a specially prepared base ensures best bonding which translates into very high durability of bowl coating. CERALON® does not use any dangerous acids in production. Thanks to it, no toxic substances are realsed while cooking and it is entirely safe for human health. The bowl can be washed in a dishwasher or hand-washed. 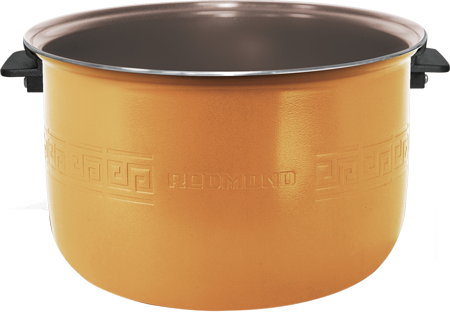 *This bowl is suitable for use with multicookers from other manufacturers. ServicesQuestions about productsPartnershipCulinary questionsCommon questionsMarketing, PR, media and etc.